One of the most commonly performed plastic surgery procedures is tummy tuck surgery. Although many patients who undergo surgery are happy with their results, some may not be satisfied with their look post-surgery. 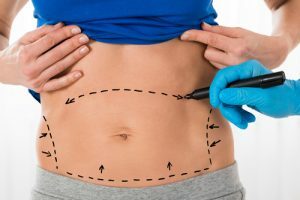 Whether you recently underwent tummy tuck surgery or it has been years since your first procedure, a revision may be necessary to create—or recreate—the look you want. Dr. Dubrow is a renowned plastic surgeon who is experienced and skilled in performing revisional tummy tucks, and he has helped many patients correct unsatisfying or botched outcomes. Botched results: Some patients receive a poorly performed procedure by a surgeon who is not qualified or experienced in the tummy tuck procedure. It is important that patients choose a board-certified surgeon, like Dr. Dubrow, who is skilled in their surgery of choice. See the most extreme plastic surgery transformations from Botched, the hit television show where he has proven his skill and talent as a revisional plastic surgery expert. Unfavorable scarring: Although there is scarring associated with surgery, sometimes, the surgical scar is placed in an overly revealing location, the scar does not heal properly, or the patient neglects to care for their surgical incision. Pregnancy: It is highly recommended that a woman waits to undergo tummy tuck surgery until she is finished having children. However, in the event of pregnancy post-tummy tuck, the original results may change, which might require a revision to correct. Weight gain: Sticking to a healthy diet and exercise regimen is important after tummy tuck surgery. Some patients may experience unwanted weight gain that causes changes in their tummy tuck results. Unsatisfying outcome: The surgeon may not have achieved the patient’s desired tummy tuck results. Patients may still have too much excess fat and skin or weak abdominal muscles that require a secondary procedure. It is crucial that patients go into surgery with realistic expectations and be fully open with their surgeon about their goals beforehand. Infection: Infection is one of the complications that can change the surgery outcome or the overall healing of incisions, which can create unappealing cosmetic results. No matter the reason for revisional surgery, Dr. Dubrow can perform your tummy tuck to help you achieve the results that best fit your body and goals. Depending on your anatomy and area of correction, he will design a personalized surgery plan. Patients may also choose to undergo complementary procedures such as liposuction to improve their physique. If you are interested in a tummy tuck revision, schedule your consultation with Dr. Dubrow today! He is a board-certified plastic surgeon who is experienced and skilled in revisional surgeries. Contact us by calling (949) 515-4111 or by filling out our online contact form.